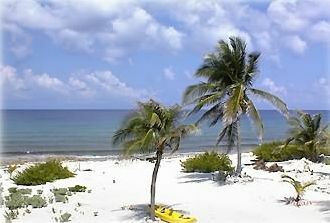 We had a really fun time on Cayman Brac. Minnie’s place was convenient and it was so nice to be directly on the water. We had dinner on the porch while the sun was setting. Minnie’s bikes were a huge plus and gave us the ability to travel the entire island. Minnie was very easy and relaxed which made the stay even more chill! Minnie does have a sweet dog who roams freely on the property and may say “hello” at your kitchen door...he may bring a pal. Minnie’s shore/beach is an Ironshore and, as with much of the island, has a large population of Spiny Anemones so accessing the water needs to be done carefully. Bring water shoes that will protect your feet. The beach area is great...Minnie had that beach trucked in which is quite a feat! If you bike around the area you can find large cutouts in the ironshore with ladders which make for safe access to the ocean. Coral hunting on the shores was terrific. The Pioneer Bakery, as so many have mentioned, is a fun spot and we did become regulars..;). We were able to connect with some fisherman early on and had some delicious Grouper fresh from the sea. The Ice Cream shop just around the corner from the apartment is very good on a hot night...jump on the bikes and grab a cone! Thank you Minnie! This was the perfect spot to escape and get away from everything. The owner Minie was great to deal with, she wasn’t here during our stay but arranged a car for us and someone to meet us at the airport and show us to the house. The spot is under the main house with a beautiful shaded deck, there are 3 areas on the beach that have hammocks and an outdoor daybed to relax on. Brac is a great little island, lots to do and see but you will just want to hang out here. You were so wonderful to get right in touch with me to let me know that you were happy with the apartment. Since I was off the island it really gave me a sigh of relief! Thank you for your sweet review. I am so glad that you enjoyed my little piece of Paradise as I was freezing up here in North Carolina. It made not being at home more bearable to know that you were having fun. I hope you will come visit again because you were the perfect guest! We loved everything about our stay at Featherstone. The house had everything that we needed and Minnie double checked to make sure that all was well. We loved having our own “private” beach (that’s how it seemed) to enjoy the sun and waves during the day and the unbelievably clear sky with so many stars at night. The wi-fi and washing machine worked perfectly, the kitchen is stocked with any appliance that you need on vacation, the linens are top notch, and the bed and pillows are super comfy. We are so happy that we discovered Featherstone and would definitely return. Thanks so much for everything, Minnie! It is not easy to have a rental on such a small island but when our guests respond as you did all the effort is repaid in spades! Thank you for being such wonderful, appreciative guests. I am looking forward to your return and to meeting you, hopefully, next time. Have a grand summer and keep us in mind when the winds start to blow! Quiet place away from it all with a great view. A very nice property away from it all. It was the perfect setup to unwind and enjoy the sea breeze. Great for 2 people, with a perfect walk out to the ocean. The property is mostly sand very clean and well kept up. The ocean front is rocky, with a short dock. This is not an island with surgar sand beaches, but this is better than most properties on Brac. It has great views, with nice places to sit and relax. Minnie is very pleasant and a friendly owner. The view from the apartment in breath taking. Minnie takes such great care of her beach area. We loved watching the waves roll in from our front porch while eating our breakfast, laying in one of the hamocks or beach chairs or in the cabana. The apartment had everything we needed for a fantastic vacation. Minnie was kind and very respectful of our privacy. Thank you for such a marvelous vacation at your paradise get away. Thank you for this great review of my apartment. I had just submitted a review of you as guests and, obviously, gave you 5 stars on every point. You were the ideal guests. I enjoyed seeing that you were having a great time and privacy is what this big beach and this property is all about. You left the apartment in such great shape that my housekeeper had trouble finding a way to do anything else to it to make it ready for future guests. Thank you for your kindness and for staying with me. I do hope you will come again and soon.